The tone that fuels Avenged Sevenfold. Order today. Formed in 1999, Avenged Sevenfold have pushed the metal/rock/guitar gods walls further away from the rest of the world. Hailing from Huntington Beach, California, the menace of Synyster Gates & Zacky Vengeance have given rise, once again, to the dueling ferocity of six string madness. Schecter Guitars has been at the forefront of their onslaught through it all. 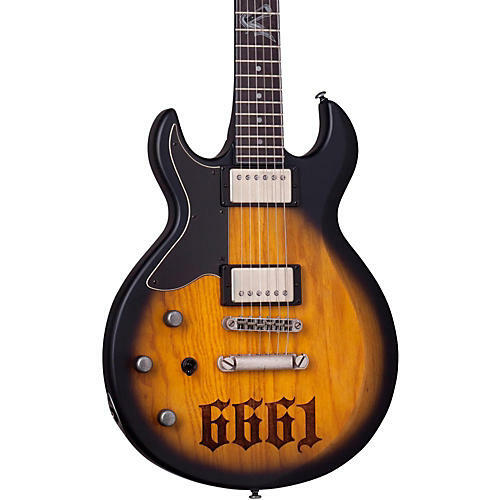 The Schecter Zacky Vengeance S-1 6661 Left-Handed Electric Guitar is as unique as the metal master who designed it. With 6661 graphics and ZV switchblade 12th fret inlay on the ebony fingerboard this Schecter guitar delivers Zacky-style riffs. The swamp ash body and mahogany neck have the classic dark tones and sustain that have defined Rock guitar. Seymour Duncan SH-4 Humbuckers with a push-pull coil-tapping on the tone control give you a wide variety of tone to play with. Grover machine heads ensure steady tuning while the TonePros bridge keeps accurate intonation. Case sold separately.